THE SHADOW Double Feature! Introducing MASKS!!! It's HORROCTOBER and today's offering is a classic: THE INVISIBLE MAN! 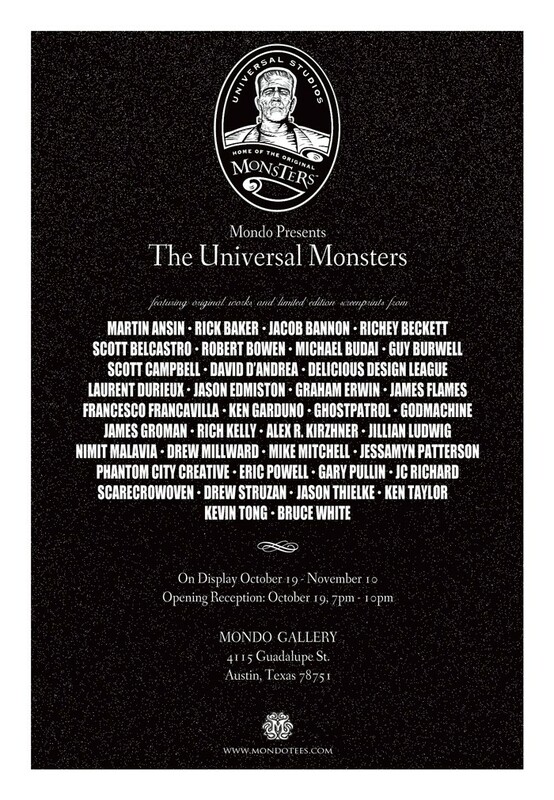 This poster was part of the "THE UNIVERSAL MONSTERS" show organized by MONDO, show that opened 2 days ago in their gallery in Austin. The screen-print poster turned out magnificent! It's 24x36" and if you missed the opportunity to get one from the regular but limited and numbered edition (405) at the show, I just received the APs (see below) so I should have them for sale at some point (when I am done with some deadlines and figure out some packing logistics). CHILDREN OF SORROW! a GHOSTLY tale of MACABRE by Remender, Peck, and Francavilla! For today's HORROCTOBER!installment, I dressed and colored a pinup of that deliciously scary horror story I did with Rick Remender and Seth M. Peck, titled SORROW. Among the many scary things I will be sharing this month, there are also 3 limited screen print posters I have done for a couple of Horror themed shows. First is the above poster of THE LIVING DEAD, a poster for the Bottleneck Gallery's "Can't Beat Em, Join Em: The Zombie Show", which runs from October 6th (this past Friday) to October 28th. I should be getting my APs sometime next week and have them on sale on my store the week after. The other two posters coming this month are yet to be announced: next one will be for MONDO's "THE UNIVERSAL MONSTERS" show in Austin (see poster below for info). I will share somethign as soon as I am allowed. The third poster is something original (and limited as for the previous ones) that will be put for sale on my store later this month. Stay tuned for more info. Once more, it's Double Feature here on Pulp Sunday! Here's my covers for THE SHADOW #9 and DARK SHADOWS #13, both in stores in December. Revolutionary Part 2 (of 4) - The Shadow finds himself face to face with George Orwell smack dab in the middle of the Spanish Civil War, but his mystic powers fail to illuminate what significance this literary legend holds for the world. No time to figure that out! The Shadow's campaign against a murderous gang of gun runners takes him on a tour of Barcelona's underbelly where he meets the beautiful and dangerous Black Sparrow! But is he really an old friend in disguise? Pause to ponder that and you might miss the deadly dogfight over the Spanish countryside. Pack a parachute, Shadow, because you're going to need it! A glimpse of the dark future of the Collins' bloodlines is revealed. What horrors reside in Collinwood in the year 1984? Will Barnabas be able to find out where it all went wrong and stop it? Or has his family's fate already been written in blood? Here's my covers for THE LONE RANGER #12 an THE SPIDER #7, both in stores in December. The epic conclusion of the Native Ground arc. The Lone Ranger has traveled through Indian lands in search of a healer for his friend Tonto. Now, the healer has been found, and she is not at all what the Ranger expected. Has the Ranger come all this way just to watch his friend die? The battle for Tonto's life and soul will be resolved. Your understanding of this iconic character will be forever changed. NEW STORY ARC! Police Commissioner Kirkpatrick lies dead. His wife grieves, and a twisted killer stalks the city. The Spider has inadvertently set into motion the chain of events that leads to his friend’s death, and now he’s out for bloody vengeance – Spider style! But will Richard Wentworth be able to resist the grieving window when she’s the woman he loves? It’s a game-changing issue of the neo-pulp sensation. Back to the regular transmissions on Pulp Sunday after the Baltimore Comicon break of last week. Today is a Horror Sunday with my cover for DARK SHADOWS #12. While I work today on the final cover of the NATIVE GROUND arc of the new LONE RANGER series, here's the latest cover (issue 11) which I hope you will all enjoy. Once again, I can't recommend enough this amazing book by Ande Parks and Esteve Polls: the trade collecting the first 6 issue just came out and it's a must have if you missed the first issues. A quick update: I have been under some tight deadlines so my focus was 100% on drawing pages, but now that I am taking a little breather, I 've been working on setting up a web based store for my books and prints in the hope to facilitate the process of ordering/purchasing for everyone. That will be the place where you will be able to get the limited prints like my MONDO's CREATURE FROM THE BLACK LAGOON or other archival giclee art prints. Stay tuned for link coming soon :). 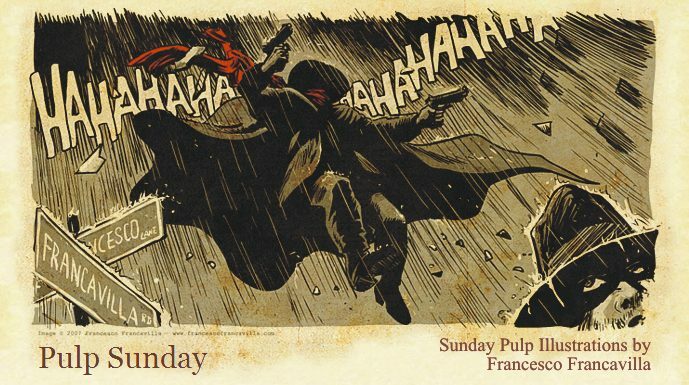 I am so HAPPY to announce that today marks the 5th Anniversary of our favorite pulp place: PULP SUNDAY! In the course of these fantastic 5 years of PULP SUNDAY I also thought this was the perfect place to debut the next Pulp Hero: my own The BLACK BEETLE. Remember those first web-based comics, and the ashcan featuring the first few pages of NO WAY OUT? Well, I AM SUPER-EXCITED to officially announce today that THE BLACK BEETLE's NO WAY OUT will be in stores this coming January 2013 with The Black Beetle #1 thanks to the fantastic and awesome friends of DARK HORSE COMICS. NO WAY OUT will be the first BB mini, with more minis coming after that. But before we get to that (and reveal the covers), today, as a PULP SUNDAY 5th Anniversary Exclusive, I give you the above cover for THE BLACK BEETLE #0, which will be in stores this December and will collect the acclaimed 3-part story titled NIGHT SHIFT (which appeared in the pages of Dark Horse Presents) plus some extra content. That's right! This means that starting in December, you will have a monthly Black Beetle fix for several months! And the Black Beetle news doesn't stop here! Alright, let the celebration begin! Thank you so much for making these 5 fantastic years, my friends, and here's to another 5 years of PULP! Today is the birthday of an author so dear to my heart (as you might know already): Howard Phillips Lovecraft. To celebrate, I have put together the above illo (based off my famous HP Lovecraft portrait) with a quote of the Man himself. Hope you enjoy it. here's a couple of pulpy covers that will hit the stores in November. The top one is for what it might be one of the coolest projects that are coming your way. BONUS QUESTION: Next Sunday (August 26th) will mark the 5th anniversary for PULP SUNDAY: should I put together something special to celebrate? - the famous WAR OF THE WORLDS radio-broadcast that made Orson Welles famous. - a tribute to the classic pulps of Edgar Rice Burroughs "JOHN CARTER OF MARS"